At Kantrowitz, Goldhamer & Graifman, P.C., we combine the experience and resources of a large firm with the care and compassion of a boutique firm. Since 1975, we have provided strategic representation and intelligent solutions for clients who faced a range of important legal issues. With a dedicated focus on matrimonial law, personal injury law and class action litigation, we take on complex cases that other firms may not be qualified to resolve. Depending on your specific case, our AV-Preeminent rated lawyers may mediate, arbitrate, negotiate or litigate in order to secure the results you need. We are equally skilled in all resolution methods, and we make it a priority to keep our clients fully informed at each stage of the process. When several people suffer the same injustices, class action lawsuits can resolve everyone’s grievances at once. Our attorneys have resolved several class action claims, including those involving high profile corporations like Nissan, Best Buy, Merck, Apple and John Hancock Mutual Life Insurance. 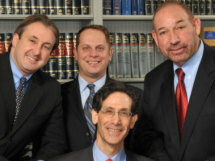 Kantrowitz, Goldhamer & Graifman, P.C., serves individuals in the Greater New York metropolitan area and throughout New Jersey. We invite prospective clients to contact our Chestnut Ridge, New York, office location to speak with one of our experienced lawyers. For your convenience, we have an additional office located in Montvale, New Jersey. Evening and weekend consultations are available upon request. Initial consultations on personal injury matters are always free. Additionally, if we decide to accept your case, we will do so on a contingency basis which means that we only get paid if and when we collect for you. Our many decades of service to individuals, couples and families in divorce matters uniquely qualify our law firm to represent you. KGG's matrimonial department has four lawyers working full-time to resolve your matrimonial problems. For all the ways that child custody and visitation can complicate your intention to divorce, KGG lawyers work hard for lasting resolutions you can live with. This may be your first divorce — but it isn't ours. If the ultimate tragedy has happened to you and your New York or New Jersey family, as the result of an avoidable accident, you can take legal action against the responsible party who caused it. And we can help.